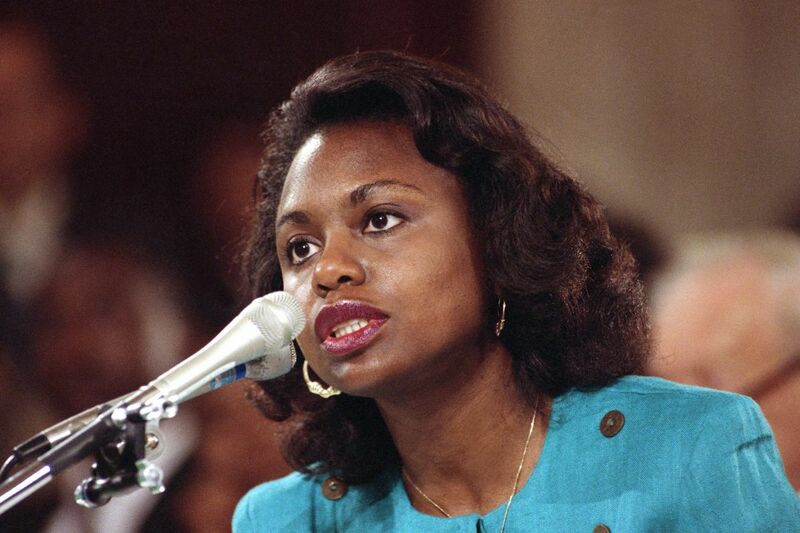 Anita Hill testifying about Clarence Thomas before the Senate Judiciary Committee on Capitol Hill in Washington, Oct. 11, 1991. About three months ago, amid the national backlash against powerful men accused of sexually harassing women, the chancellor at Rutgers-Camden reached out to fellow law professor Anita Hill. Chancellor Phoebe A. Haddon, a contemporary of Hill's who had gotten to know her over the years, asked if Hill would serve as the law school's commencement speaker. Hill's pioneering role against sexual harassment — she accused then-U.S. Supreme Court nominee Clarence Thomas in 1991 — wasn't the primary reason for the invite. But certainly, Haddon said, the burgeoning #MeToo movement and its fallout provides an ideal context for Hill's address Thursday in Camden. And Rutgers wasn't the only school to think so. In coming weeks, Hill will also address graduates at City College of New York and Wesleyan University in Middletown, Conn. She's replacing author Daniel Handler, whose pen name is Lemony Snicket, who stepped away from the role after allegations that he had made inappropriate remarks to women. Hill's invites come in a year when female commencement speakers will take the stage at some of the nation's most prominent colleges and universities. Nearly 60 percent of speakers at the 25 schools with the largest endowments will host women speakers this year, the Associated Press reported, after a nearly two-decade stretch where women had accounted for only about a quarter of the speakers at those schools. Some speakers already have referenced #MeToo and "Times Up" — Hollywood celebrities' movement against sexual harassment. "Feel empowered by the women and men who are no longer willing to tolerate the abuse of sexual predators," veteran NBC News anchor Andrea Mitchell told thousands of graduates at her alma mater, the University of Pennsylvania, on Monday. "MeToo and Times Up can teach us a kind of courage I never imagined as a 16-year-old freshman first arriving at Penn." Andrea Mitchell addressed Penn graduates on Monday. Whether Hill, a law professor at Brandeis University in Waltham, Mass., will discuss her decades-old trailblazing against sexual harassment and the #MeToo movement is uncertain. Haddon said her primary reason for inviting Hill is Hill's current work as an advocate for more women to participate in science, technology, engineering and math professions, commonly known as STEM. "I know that's what drives her and energizes her today, and I think that's so important for our students to hear," Haddon said. Hill declined to be interviewed about her speech. She has reflected publicly on the mounting allegations against media and entertainment stars elsewhere. In the last year, she agreed to chair the Commission on Sexual Harassment and Advancing Equality in the Workplace, a new group aimed at eradicating harassment in the entertainment industry. And in a New York Daily News opinion piece last October in the wake of allegations against movie mogul Harvey Weinstein, she wrote: "Despite a generation growing up hearing that sexual harassment is unacceptable, it clearly remains a plague." Hill will take the stage in Camden in a year when a wave of women are seeking political office and as famous men have lost their jobs after sexual misconduct accusations. "I don't think they're disconnected either," said Shauna Shames, an assistant professor of political science at Rutgers-Camden. Both, she said, have been "fueled by a longstanding and national anger about women's treatment that reached a boiling point." Earlier this month, actress and New York gubernatorial candidate Cynthia Nixon, addressing graduates at the Helene Fuld College of Nursing in New York, applauded women all over the world who are fighting back and seeking political office to make a difference. They include, she said, "the women from Hollywood to Washington to everywhere in between who followed Tarana Burke's lead to say Me Too and Times Up for sexual harassment and violence against women, who have taken a story about monsters and turned it into a story about heroines." New York Democratic gubernatorial candidate Cynthia Nixon responds to a question during a news conference in Albany. Burke, a former Philadelphia artist and fashion blogger and survivor of sexual harassment, coined #MeToo in 2006 and saw it take on international meaning, following revelations about Weinstein. Female speakers, including Hillary Clinton at Yale, Facebook executive Sheryl Sandberg at MIT, and actress Mindy Kaling at Dartmouth, are headlining many other major commencements. Ronan Farrow, one of the journalists who first exposed allegations against Weinstein in the New Yorker and won a Pulitzer Prize for it, also hit on the issue of sexual harassment at Loyola Marymount University's commencement in Los Angeles on May 5. "We are hearing the voices of sexual assault and harassment survivors who were for so long silent," Farrow, the son of Mia Farrow, told graduates. "We are grappling, as a culture, with our collective failure to create spaces that treat men and women equally and that treat everyone with respect and dignity. And we are learning a lot about how powerful men, who did despicable things, were protected for so long." Phoebe A. Haddon, the chancellor of Rutgers-Camden. In Camden, Haddon recalled well the mood among many of her colleagues more than a quarter-century ago when Hill was aggressively questioned by a panel of male senators at the confirmation hearing. Haddon was then a law professor at Temple University and it was during her time at Temple that she got to know Hill. There were few black female law professors at that time, she said, and Haddon and her colleagues were in awe of Hill's willingness to take a stand when many were not. They were riveted by the hearing. "We were outraged," Haddon recalled. "It was very disconcerting and a call to action." Books were written. Conferences were held. People spoke out. She joined a network called, "Ain't I a Woman," named after a piece written by an African American abolitionist and women's rights pioneer. But #MeToo showed problems have persisted, Haddon said. She hopes Hill's address will give rise to a new round of conversations about all kinds of inequalities and the need to address them. Thursday, however, will be about honoring a woman who made a difference decades ago and continues to make a difference. "As an advocate for a just and equitable society, you are respected for your courage to stand up for the rights of every American citizen and your commitment to doing so with unwavering moral integrity," her Rutgers-Camden citation states. "Your courage to stand against sexual harassment and assault remains inspirational for all of us."